Indulge. Without. Guilt. That’s our motto around here. And this chocolatey, skin-softening and antioxidant-packed face mask is sure to do the trick! 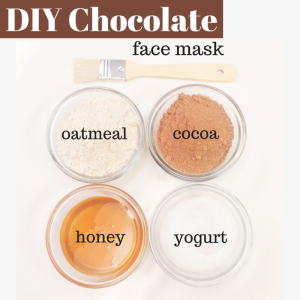 Check out our recipe below for a quick and simple chocolate-inspired mask that will leave your skin soft and glowing. Organic Cacao Powder: Contains powerful antioxidant properties which fight against free-radicals and reduce the signs of aging. Contains flavanoids, which help to maintain collagen and fight against sun damage as well as help to absorb UV light. Honey: Contains natural antioxidant properties which protect against damaging free radicals while attracting and holding in moisture (humectant). Contains natural antimicrobial properties and provides mild UV protection. Oatmeal: Known for soothing and calming the skin, studies have shown it relieves pain and itching by inhibiting prostaglandin synthesis, thus reducing pain and inflammation. It is used as a first-line treatment to alleviate the symptoms of psoriasis, eczema, and atopic dermatitis. Oatmeal soothes and moisturizes skin and helps relieve dry, itchy skin. Yogurt: Contains lactic acid, a natural alpha hydroxy acid (AHA), which exfoliates the epidermis, the outer layer of skin, helping to reveal softer, smoother looking skin, while speeding up the rate of cell turnover. Gently massage into skin until evenly applied. Relax and leave on skin for 15-20 minutes. What are your favorite at-home face masks? Share them with us in the comments below for your chance at having your DIY recipe featured on our blog! Looking for other chocolatey body products? Check out our Chocolate Decadence Body Butter and Chocolate Decadence Hydrating Body Lotion, Chocolate Lip Balm and our Mocha Mint Cappuccino Body Scrub (Organic). WARNING/CAUTION: For external use only. If product contacts eye, wash eye immediately with large amounts of water for several minutes, especially under the eyelids. Consult a physician if irritation occurs or persists. Do not use if you have allergies to the ingredients listed above. Patch testing recommended prior to use. All products and recipes found within blog posts are not intended to treat, prevent or cure disease.